Designed for use on bulk filling lines, the BEL 450 provides a cost effective alternative to the difficult process of manually inserting poly bag liners into corrugated cases. Cases are placed on the vacuum plenum after which a poly bag liner is placed into the box. The bag is quickly drawn fully into the case leaving no voids in the box corners, and the case is then ready to be filled. Filling of cases can be done manually or automated further with the inclusion of an optional programmable weigh scale that can also verify count. Alternatively the BEL 450 can be fitted with an optional load cell for interfacing with existing automatic scale filling equipment such as auger or hopper fillers, and belt feeders. 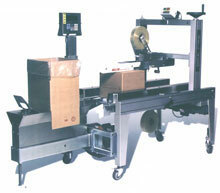 After filling, the operator closes the poly liner, folds the top case flaps closed and moves the case forward into the conveyor where tape is automatically applied to seal the top and bottom flaps. The BEL 450 is an ideal solution for automating bulk packing lines and can quickly recover its' modest investment through labor savings and improved efficiencies.